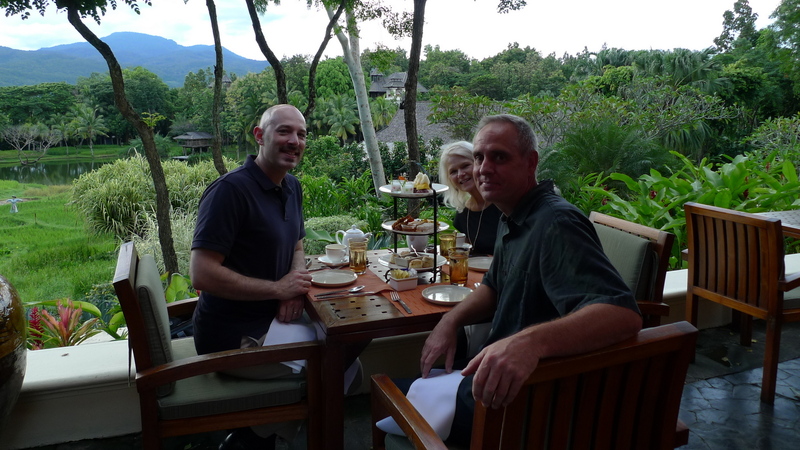 While in Chiang Mai a few weeks ago with visiting guests, I made a stop at the Four Seasons resort for afternoon tea. The resort is located about a thirty-minute drive north of town, which only enhances its feeling of being in the middle of nowhere. The resort is gorgeous and the afternoon tea is a worthwhile splurge for an hour or two of pampering yourself. The resort is arranged around a pond designed to look like a Northern Thai village complete with rice paddies. The only buildings you see are those belonging to the resort and with the mountains in the distance, you could easily be forgiven for thinking you had been transported to some magical Thai Brigadoon. At 5:00, the “farmers” (resort employees dressed in traditional Northern Thai farmer’s clothes) paraded across the paddies to the rhythm of a gong, “returning” to the village, a touch that was a bit kitschy but also fun. Trish, Allen, and I pose for a picture at the Sala Mae Rim restaurant. We didn’t make reservations but fortunately were able to get a prime table, perhaps because it was the midst of rainy season and the slowest time for tourists. We ordered one tea set (designed for two) plus an extra pot of tea, which was more than enough food for the three of us. The total price was approximately US$50, more than I would usually spend but certainly a worthwhile treat while on holiday. 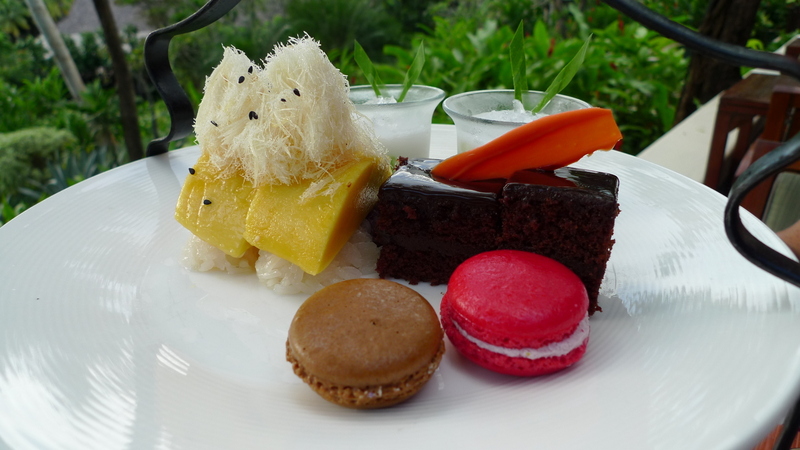 The top plate in the tea set featured mango sticky rice with a palm sugar floss; crisp water chestnuts in sweet coconut milk; Parisian macaroons, and chocolate truffle cake. 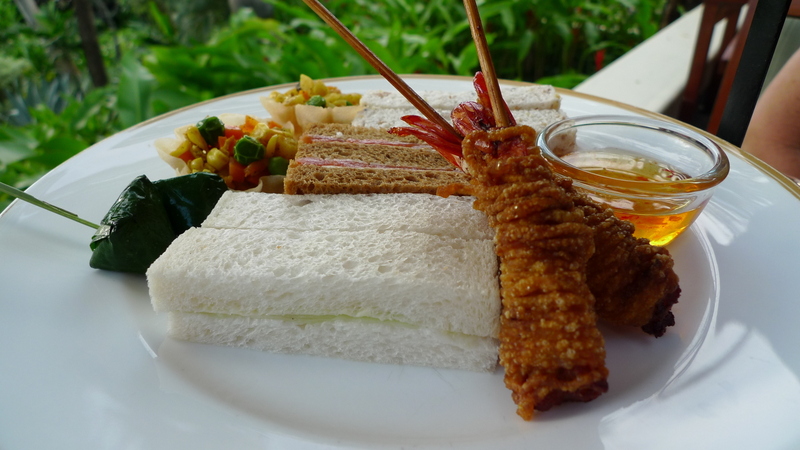 The middle plate in the set featured finger sandwiches (ham and cheese, cucumber, and smoked salmon); fried shrimps wrapped in egg noodles, miang kham (a Thai snack of betel leaves wrapped around savory fillings); and krathong tong (literally “golden baskets” – crispy shells filled with minced chicken and shrimp). 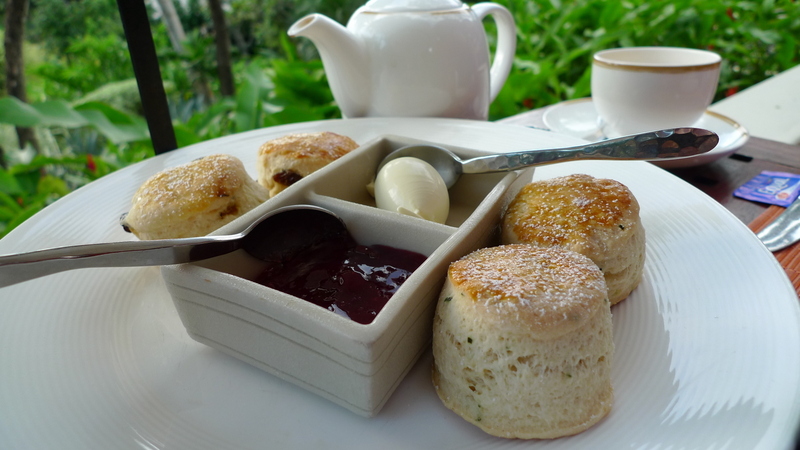 The final plate in the set featured kaffir-lime and raisin scones, served with clotted cream and strawberry jam. All the food was fantastic and the portions were more than adequate for the three of us. After almost two hours of indulgence, we finally left paradise to return to the city. Without a doubt, the Four Seasons is on my list for future visits. While it may be too far away from the city to actually stay at (unless you specifically want to escape from the world), it is worth a visit for tea. This entry was posted in Thailand, Travel and tagged afternoon tea, Chiang Mai, food, Four Seasons, hotel, Northern Thailand, Resort, tea, Thailand, travel by christao408. Bookmark the permalink. The mango sticky rice looks delicious! 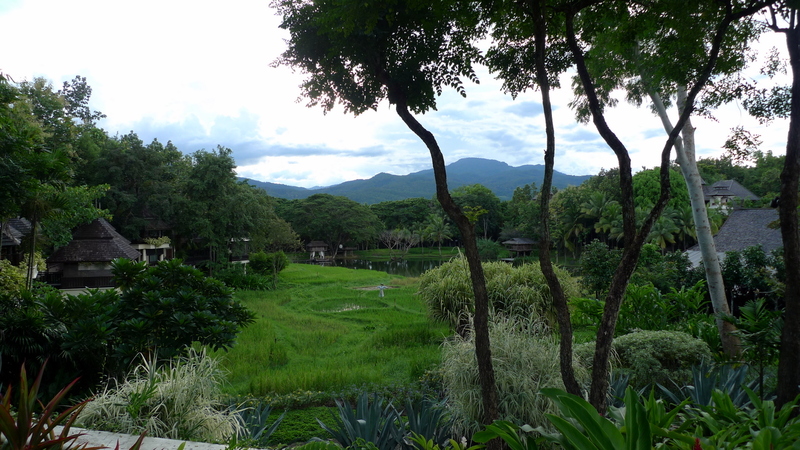 I missed Chiangmai Mai, especially the green hillside and rice paddies. This is a beautiful place. I love the view of the mountains in the background, and those macaroons look wonderful! What a wonderful place to sit with friends over some very lovely snacks. I am wondering if the mango sticky rice is high in carbs, and it looks absolutely delishious. What a glorious place to kick back and enjoy some delectable treats. Yes, it really was spectacular. The pictures are better here. I think Xanga changes the resolution of the pictures during uploading. I think so, too. I literally copy the same post between the two, but upload the pictures to both places. The WP pics are better. Remind me again, why did I spend money helping save Xanga? Beautiful pictures. Is it true that Chiang Mai isn’t as hot? It looks nice and pleasant, judging by the pictures. Well, during most of the year the daytimes are just about as hot as anywhere else. The thing is, the evenings cool down a bit more because of the higher elevation. The winters are also generally a few degrees cooler. Oh, I thought it was more dramatic than that. Beautiful place and food. The sticky rice looks especially interesting. Is the rice flavored in some way or does the mango provide all of the flavor? Do they grow tea in Thailand? Yes, I was thinking it would be fun to stay there sometime. You have to make your site informative and enjoyable to read, if you want to begin making easy money. and prepare a site during the earliest, most pliable phases of the internet design procedure. Second, when you’re looking for a solution, you will read copy as helpful, not hype-y.